Lamb to Loom - The Story of Skye's Forgotten Weavers. 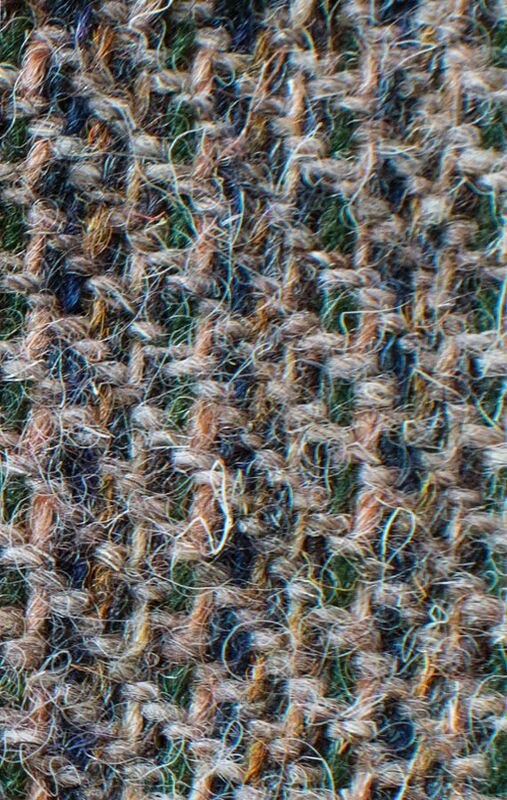 Harris Tweed is famous the world over. But did you know that Skye once had its own cottage-based weaving industry? An exhibition and events programme next week in Portnalong, near Talisker on Skye’s west coast, will tell its intriguing story. And as proud inheritors of this local tradition we’re thrilled to be involved. 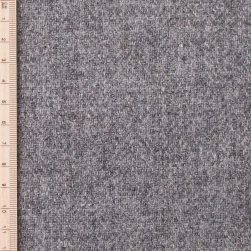 ‘Port-na-Skye’ – The New Harris Tweed? Portnalong and its neighbouring townships of Fiskavaig and Fearnilea were created after World War I when the Board of Agriculture bought land to offer to people wanting to make a new life. Over 60 families moved there, most of them weavers from overcrowded townships on the Isles of Harris and Lewis. Small weaving sheds were provided on the crofts, and spinning, knitting and weaving became important sources of income for the settlers. Port-na-Skye tweed, as it was known, was sold to passing trade and tourists who arrived by boat and later by motor car. 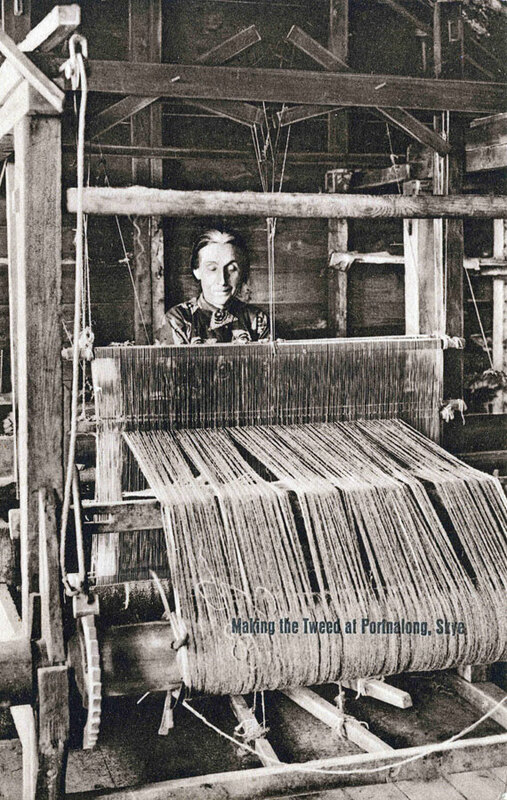 Production methods became more sophisticated with the introduction of Hattersley Looms, and many different colours and patterns were made until the early 1970s. Although Port-na-Skye failed to enjoy the commercial success of Harris Tweed there remains a strong interest in spinning and weaving within the local community to this day. 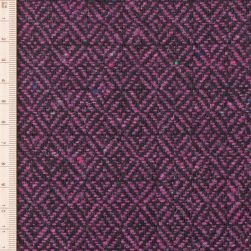 Tweed woven by Euan MacLeod at no. 14 Portnalong in the mid-1960s. 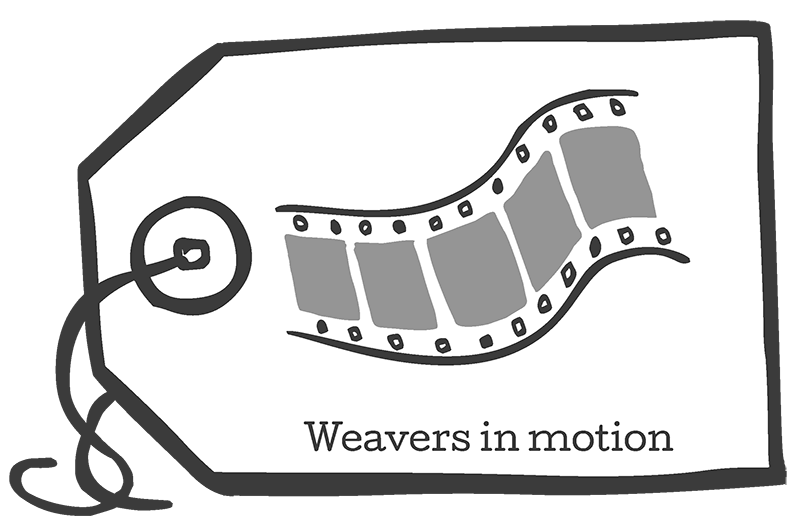 Getting the fleece from lamb to loom was a time-consuming process for the Portnalong weavers. 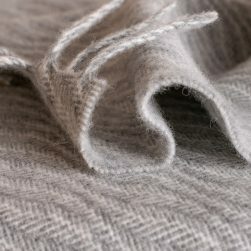 After shearing, the fleece would be scoured in the stream and dyed in large pans over the fire, using local plants and roots. 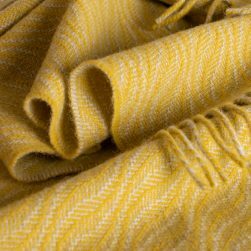 It was then hand-carded to sort the fibres, spun into yarn on a spinning wheel and finally wound onto cones ready for weaving. The cloth was woven on a large wooden floor loom or a smaller table-top loom, and taken by men to be washed in the stream. 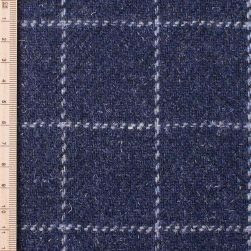 It was finished by the women, who sat around a large table where the soaked tweed was rhythmically thumped to shrink and soften the fabric. The finishing process, also known as ‘waulking’, was hard graft but also a great social occasion with lots of gossip and songs to keep the rhythm and lighten the work. While our singing is best avoided at Skye Weavers, we otherwise like to keep local traditions alive. Although our looms use a different mechanism to those used in Portnalong in the early 20th century, they are still powered manually, in our case by bicycle pedals. And while waulking is no longer the communal activity it was, our skilled finishers – Schofield in the Scottish Borders – are long established experts with an attention to quality that is second to none. (And we’re sure they enjoy a gossip in their spare time too.) 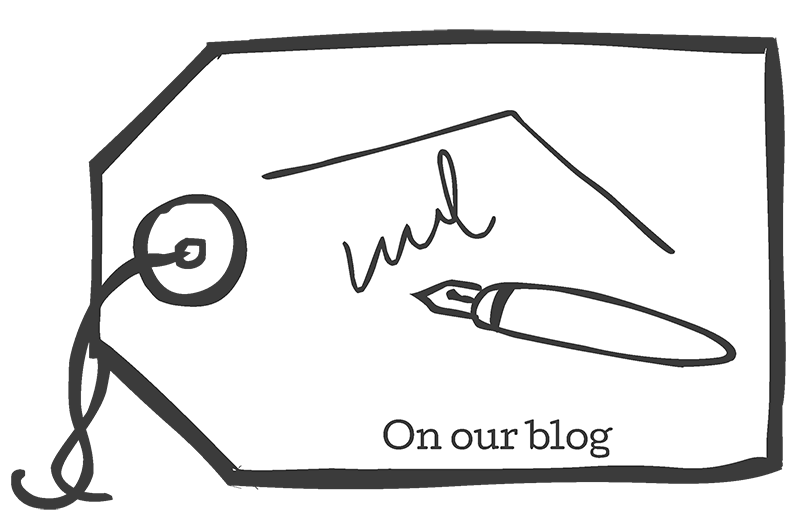 You can follow our own tweed-making journey here. 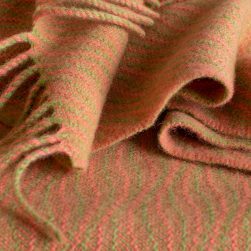 We’re especially proud of our Skye Wool range using local fleeces. 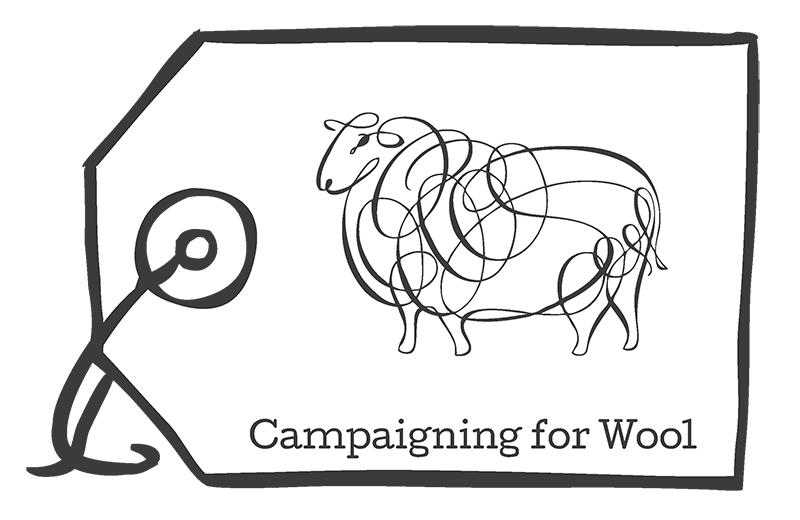 This year we have something extra special as part of the ‘Lamb to Loom’ exhibition programme: Sgioba Luaidh Inbhirchluaidh, the Inverclyde Waulking Group, will be singing waulking songs while finishing some of our Skye Wool tweed in the Minginish Village Hall. Come and watch them at work/waulk on Thursday 28 – Saturday 30 June, and join a Thursday afternoon workshop. I would like to receive emails about your products and other news. Check out recent additions to our range.